Obituary – Lamb, Dr. Alton Charles « Perry High School Alumni Association, Inc.
﻿- 17-year-old son of Mr. and Mrs A. C. Lamb, has been vice president of the student council and senior counsellor of DeMolay during the past year. He was born on January 12, 1924, in Perry, and has attended only the Perry schools, He is a member of DeMolay, of the Perry high school band, and student council. 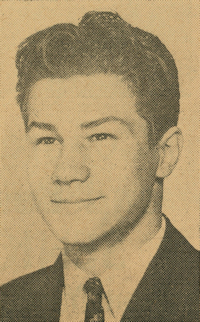 Charles appeared in both the junior and senior class plays in high school. He plans to attend college either at Toakawa or at Stillwater next year. Charles Lamb was born January 12, 1924 in Perry, Oklahoma. He was the only child of Alton Charles and Opal Lamb. Charles met his wife, Ruth, while they were attending Oklahoma A & M (now Oklahoma State University). They were married May 21, 1943. Charles answered the Army’s call to duty, serving in the European Theater during World War II as an electrician. After the war, Charles took his wife and baby boy to Memphis, Tennessee, where he studied at Southern College of Optometry, graduating Valedictorian of his class in 1947. Charles began his Optometric career in Perry, then moved his growing family to Seattle. In 1949 he opened his practice in Columbia City where he remained until retirement. People in the community could set their clocks by Charles’ routine walks to breakfast and lunch, the bank and Post Office. Retirement brought the pleasure of coffee each morning with his buddies at Starbucks. Charles was a President of the Rainier Businessmen’s Club, President of the Washington Optometric Association (now Washington Association of Optometric Physicians) from 1962 through 1964, and the WOA Man of the Year in 1965. He was ordained as an Elder at the First Presbyterian Church in Perry in 1948. He served Mount Baker Park Presbyterian Church as a Deacon (ordained in 1981), Elder, Trustee, and most recently, Treasurer. Charles was a dedicated, 51-year member of Lions Club, where he served as President in 1962 and 1963, and Zone Chairman in 1965. He was on the Board of Directors for 40 years. His particular passion was the Lions’ Insight Center, where he served on the Board of Directors for 15 years. He was also active in Masonic organizations. Charles had simple tastes. He loved his wife of 54 years, his family, home, Husky football, dark chocolate, strong coffee, and fine wine. He grew the best tomatoes and green beans in King County. Although he bravely fought his battle with cancer, since Ruth’s death in 1997, Charles has anticipated their reunion. We can only imagine their joy today.